New railings and gate on east side of Lifeguard parking lot, facing Abbott Street. It’s very ironic that as the OB Rag has been writing about restaurants taking over public space on Newport Avenue, one of our public institutions – the lifeguards – now is taking over public access space. The pictures attached show the lifeguard station in the process of installing a fence surrounding their parking lot. This fence will also block a public sidewalk that is extremely heavily used to access the beach directly across from the curbcut on Abbott (I myself use it – or used it – multiple times every day). As far as I know they’ve done this without any public notice or input. Tourists and visitors, as well as locals, use this access path. 6-8 years ago, I believe, the Lifeguards and the City of San Diego, presented a plan for a new lifeguard station. That plan had a big wall around the entire property and concerns were raised by OB planners then about restricting access to the beach as well as creating a compound look at the focal point of our community. Lifeguards had claimed they need the wall for security reasons and because of the dangers of pulling into the parking lot. This was much of the reasoning when the lifeguards pressed for having stop signs on Abbott right in front of the station – which have been installed. If there are now still dangers, the City / Lifeguards should be able to provide the incident reports that show traffic accidents, thefts or assaults justifying a fence around a public space. Up to now, no one has provided any of this. As far as I know this is the only lifeguard station in the county that will have a fence – furthering the stereotype that OB is a dangerous place (and this fence may just be a start towards implementing their ultimate plan to wall off the entire property). Now, I realize that it’s not the lifeguards themselves doing this – it’s the City. Is the City simply carrying out the wishes of the lifeguard management? 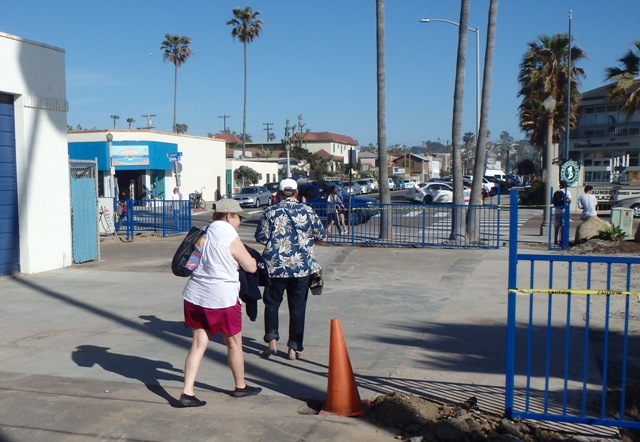 When OB planners – me included – recently updated the OB Community Plan we had a very specific point stating that there should not be walls around public or private structures at the beach. The city made us revise this statement and take out the “public or private” because they said that would be assumed. However, I recall that the “public” part of this statement was written with the lifeguard project in mind (there are still copies of the first draft of the community plan that shows the language we wanted). Unfortunately, I can’t even find that revised statement in the posted Community Plan. I’m not sure if it got cut in its entirety at some point late in the process or what, but I’ll have to check my notes for the specific location it used to be. Clearly OBceans and their dogs and kids use this access path. Soon it will be locked up, without public input. Significantly, one of the goals of the Community Plan was always to improve public access – which this new encroachment clearly does not do – and to limit the walls/fences/compounds in OB especially along the waterfront. Most will say stop whining and just walk around the north side of the Lifeguard Station – which is near the bathrooms and shrunk by the overhang of cars. This area is already heavily trafficked and difficult for anyone with a bike, stroller or wagon. However, that misses the major point that our public agency should not be leading the way in restricting access and putting fences up at the beach in direct opposition to what the community has stated it desires – namely, the lack of walls/fences creating a compound look around public and private facilities. It’s disappointing that this unnecessary restrictive eyesore is being thrown up without any public notice or input but like the others there is probably nothing that can be done – although I will certainly continue to cut through the parking lot whenever the gates are open. It looks like an informal access path through the lifeguard station parking lot. That that pass is heavily used is a giant understatement….planning to go down and talk to the lifeguards today….bad idea, seems to me. 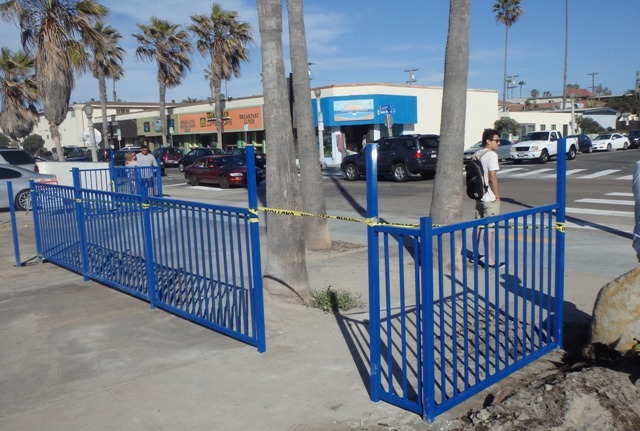 I could be wrong, but I don’t recall this specific railing/ gate installment ever coming before the OB Planning Board. Once again, it’s a trend that I’ve witnessed literally for decades and getting quite tired of it – city departments bypassing the only local OB institution that is responsible for overseeing and monitoring infrastructure improvements or developments: the Ocean Beach Planning Board. Seems the money had to come from the city to put this fence up. Lord knows the lifeguards need money for SO many things in that run down dilapidated building. I didn’t think this would be the first thing put up. Following. Please report back Tess if you find out anything. This is great, now I won’t get hassled by beach goers when I smoke crack behind the new vietnam wall going in. Looks like hell and it will rust out in a few years and then really look like hell. I have a hunch that fence has more to do with that stupid memorial that is going in than the lifeguards.